Applied Hierarchical Modeling in Ecology: Distribution, Abundance, Species Richness offers a new synthesis of the state-of-the-art of hierarchical models for plant and animal distribution, abundance, and community characteristics such as species richness using data collected in metapopulation designs. These types of data are extremely widespread in ecology and its applications in such areas as biodiversity monitoring and fisheries and wildlife management. 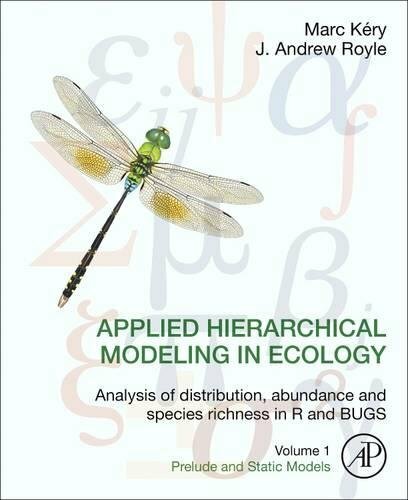 This first volume explains static models/procedures in the context of hierarchical models that collectively represent a unified approach to ecological research, taking the reader from design, through data collection, and into analyses using a very powerful class of models. Applied Hierarchical Modeling in Ecology, Volume 1 serves as an indispensable manual for practicing field biologists, and as a graduate-level text for students in ecology, conservation biology, fisheries/wildlife management, and related fields. If you have any questions about this product by Academic Press, contact us by completing and submitting the form below. If you are looking for a specif part number, please include it with your message.